How to Crochet Doll Clothes. Part 2. A crochet doll clothes we are going to make for the doll presented at the left picture below. 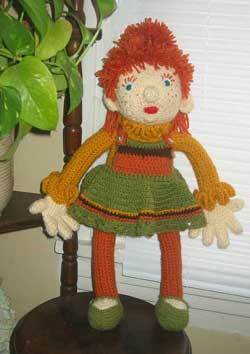 Instruction about making this doll can be found at the Crochet Doll page (Part 1). (It doesn't look too attractive so far... :-). Now we have to make it look decent. Let's compare original and final "products", to decide what should be done. It is my first experience of` making a crochet doll. That's why I tried to keep it simple. Nevertheless, it will still require some work to be done to make it look decent -:). Here is a plan. First of all, my beauty needs a hairdo. Having her own face won't heart her also. And besides that, any decent girl has to have a dress. Let us begin to make a crochet doll clothes and her face.! Crochet doll Clothes. Final "product". There are a few choices you can make hair for a doll. The one I've chosen this time perhaps is the simplest one. Length of the yarn for each "piece" of hair has to be twice as long as its final length. The way to fasten them to the fabric is described at a Girl Sweater page. 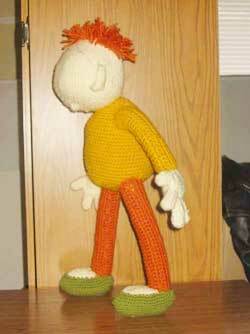 Since for this project hair has to be done on the stuffed head of a doll, I prefer to use a latch hook instead of a regular crochet hook. It is just easier to work. To make doll's hairdo more stylish, I attached pompom on the top of the head. 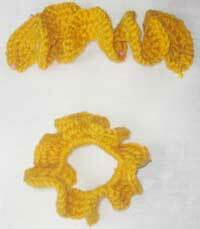 Description for making pompom can be found at a Crochet Scarf page. Once all pieces of hairdo are on place, trim them to make it look neat. A NOSE. Crochet a small circle (3-4 rows). Don't add stitches in the last row to make it look like a cap. Stuff it and sew somewhere at the horizontal line which connects midpoints of the ears. A MOUSE, BROWS, and LASHES are all embroidered. The past-on EYES are from the craft store ( $ 1/ 24 pc). Glued on the doll's face. A SKIRT. Chain number of stitches necessary to wrap around a doll waist line (first you have to decide where it is -:) or a little longer than that. Make a slip stitch to join in a circle. Crochet a circle. 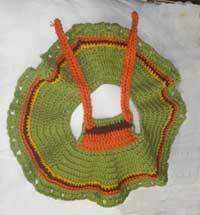 Here is the rule how to keep crochet circle flat. I decided that my beauty has to have more luxuriant skirt. That's why I didn't try to keep it flat and made more increases per each raw then for a flat circle. A COLLAR and the CUFFS. Cuffs (3-4 rows of single crochets) are made the same way like a skirt. Unlike a skirt more stitches per each row have to be added to make them wavier. Collar is just as wide as the cuffs are, but was crocheted like a strip instead of a circle. Here is a final "product" . This basic technology of making a crochet doll allows us to create a whole family of the dolls each of which will look different and have its own character. Happy crocheting!